Overview: The SKYDECK is a CONCENTRATED INTERVENTION along the Detroit-Superior Bridge that is HIGH IMPACT. 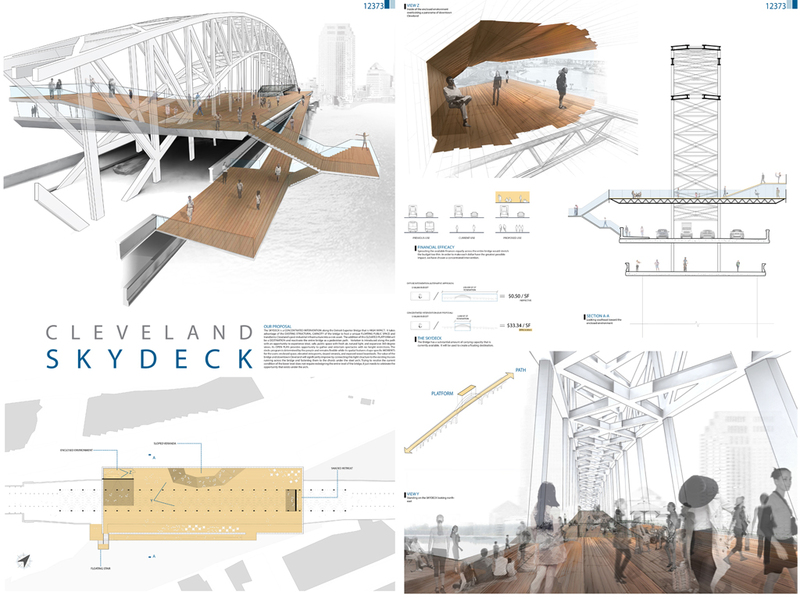 It takes advantage of the EXISTING STRUCTURAL CAPACITY of the bridge to host a unique FLOATING PUBLIC SPACE and transforms Cleveland’s post-industrial infrastructure into a civic asset. 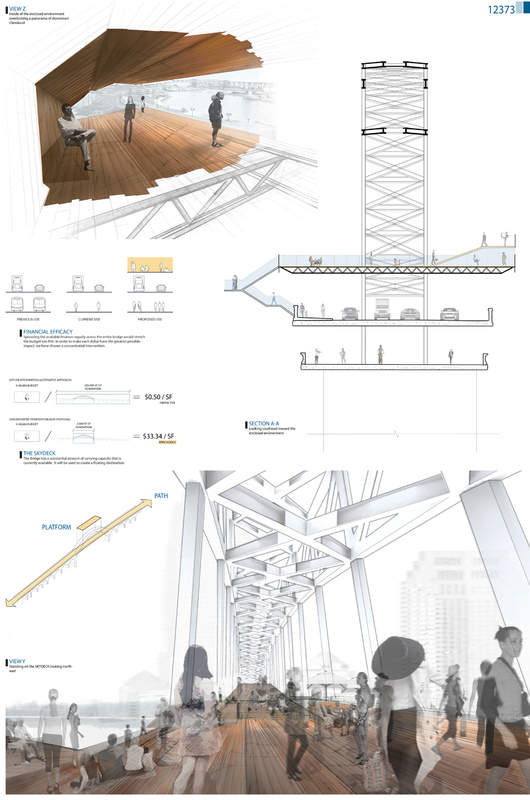 The addition of this ELEVATED PLATFORM will be a DESTINATION and reactivate the entire bridge as a pedestrian path. Variation is introduced along the path with an opportunity to experience ideal, safe, public space with fresh air, natural light, and expansive 360 degree views. Its OPEN PLAN provides opportunity to gather and entertain spectacles with no height restrictions. 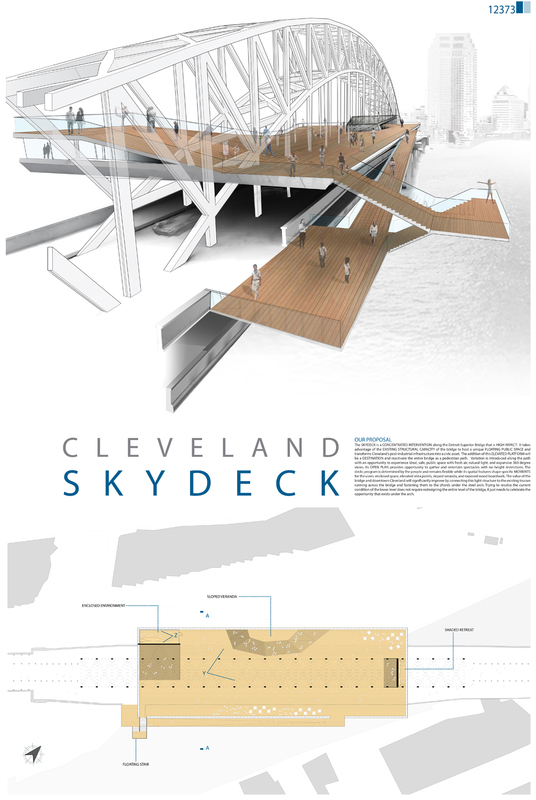 The decks program is determined by the people and remains flexible while its spatial features shape specific MOMENTS for the users: enclosed space, elevated vista points, sloped veranda, and exposed wood boardwalk. The value of the bridge and downtown Cleveland will significantly improve by connecting this light structure to the existing trusses running across the bridge and fastening them to the chords under the steel arch. Trying to resolve the current condition of the lower level does not require redesigning the entire level of the bridge, it just needs to celebrate the opportunity that exists under the arch.